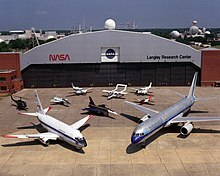 Langley Research Center (LaRC or NASA Langley) located in Hampton, Virginia, United States, is the oldest of NASA's field centers. It directly borders Langley Air Force Base and the Back River on the Chesapeake Bay. LaRC has focused primarily on aeronautical research, but has also tested space hardware at the facility, such as the Apollo Lunar Module. In addition, a number of the earliest high-profile space missions were planned and designed on-site. Established in 1917 by the National Advisory Committee for Aeronautics (NACA), the research center devotes two-thirds of its programs to aeronautics, and the rest to space. LaRC researchers use more than 40 wind tunnels to study and improve aircraft and spacecraft safety, performance, and efficiency. Between 1958 and 1963, when NASA (the successor agency to NACA) started Project Mercury, LaRC served as the main office of the Space Task Group. In June 2015, after previously serving as associate director, then deputy director, Dr. David E. Bowles was appointed director of NASA Langley. After US-German relations had deteriorated from neutral to hostile around 1916, the prospect of U.S. war entry became possible. On February 15, 1917, the newly established Aviation Week warned that the U.S. military aviation capability was less than what was operating in the European war. President Woodrow Wilson sent Jerome Hunsaker to Europe to investigate, and Hunsaker's report prompted Wilson to command the creation of the nation's first aeronautics laboratory, which became NASA Langley. In 1917, less than three years after it was created, the NACA established Langley Memorial Aeronautical Laboratory on Langley Field. Both Langley Field and the Langley Laboratory are named for aviation pioneer Samuel Pierpont Langley. The Aviation Section, U.S. Signal Corps had established a base there earlier that same year. The first research facilities were in place and aeronautical research was started by 1920. Initially the laboratory included four researchers and 11 technicians. Langley Field and NACA began parallel growth as air power proved its utility during World War I. The center was originally established to explore the field of aerodynamic research involving airframe and propulsion engine design and performance. In 1934 the world's largest wind tunnel was constructed at Langley Field with a 30 × 60 foot test section; it was large enough to test full-scale aircraft. It remained the world's largest wind tunnel until the 1940s, when a 40 × 80 foot tunnel was built at NASA Ames Research Center in California. Early in 1945, the center expanded to include rocket research, leading to the establishment of a flight station at Wallops Island, Virginia. A further expansion of the research program permitted Langley Research Center to orbit payloads, starting with NASA's Explorer 9 balloon satellite in mid-February 1961. As rocket research grew, aeronautics research continued to expand and played an important part when subsonic flight was advanced and supersonic and hypersonic flight were introduced. Langley Research Center can claim many historic firsts, some of which have proven to be revolutionary scientific breakthroughs. These accomplishments include the development of the concept of research aircraft leading to supersonic flight, the world's first transonic wind tunnels, the Lunar Landing Facility providing the simulation of lunar gravity, and the Viking program for Mars exploration. The center also developed standards for the grooving of aircraft runways based on a previous British design used at Washington National Airport. Grooved runways reduce aquaplaning which permits better grip by aircraft tires in heavy rain. This grooving is now the international standard for all runways around the world. Full-scale model of the X-43 spaceplane in LaRC's 8-foot (2 m) high temperature wind tunnel. Langley Research Center performs critical research on aeronautics, including wake vortex behavior, fixed-wing aircraft, rotary wing aircraft, aviation safety, human factors and aerospace engineering. LaRC supported the design and testing of the hypersonic X-43, which achieved a world speed record of Mach 9.6 (almost 7,000 miles per hour). LaRC assisted the NTSB in the investigation of the crash of American Airlines Flight 587. Work began in July 2011 to remove the 1940s era 16 feet (4.9 m) transonic wind tunnel. The facility supported development and propulsion integration research for many military aircraft including all fighters since 1960 (F-14, F-15, F-16, F-18 and the Joint Strike Fighter) but had been inactive since 2004. Langley retained transonic wind tunnel testing capabilities facilities in the National Transonic Facility, a high pressure, cryogenically cooled 8.2 feet (2.5 m) closed loop wind tunnel. Overall, Electron Beam Freeform Fabrication is a layer-additive technique that offers potential for improvements in cost, weight, and performance to enhance mission success for aircraft, launch vehicles, and spacecraft. LaRC also houses a large collection of various inexpensive plastic reformation machines. These machines are critical in the freeform fabrication department for faster timing, better precision, and larger quantities of low-cost toy, model, and industrial plastic parts. The fabrication of plastic parts is not all that dissimilar to the EBF³ process, except the melting apparatus is a thin, grated heating element, but other than that they are quite similar, e.g. they are both run completely by CAD data and deal with various freeform fabrication of raw materials. Plastic reformation machines have also come to the interest of graphical artist, opening a whole new world of bringing their masterpieces to life, all with a 'flick' of a switch, so to speak. Since the start of Project Gemini, Langley was a center for training of rendezvous in space. In 1965, Langley opened the Lunar Landing Research Facility for simulations of moon landings with a mock Apollo Lunar Module suspended from a gantry over a simulated lunar landscape. There was experimental work on some Lunar Landing Research Vehicles (LLRV). Langley Research Center conducts earth science research to support NASA's mission. LRC scientists and engineers have won the Collier Trophy 5 times. In 1929 for the development of low-drag cowling for radial air-cooled aircraft engines, 1946 to Lewis A. Rodert, Lawrence D. Bell and Chuck Yeager for the development of an efficient wing deicing system, 1947 to John Stack of the then Langley Memorial Aeronautical Laboratory for research to determine the physical laws affecting supersonic flight, also shared in this trophy for their work on supersonic flight, 1951 to John Stack for the development and use of the slotted-throat wind tunnel, 1954 Richard T. Whitcomb for the development of the Whitcomb area rule, according to the citation, a "powerful, simple, and useful method of reducing greatly the sharp increase in wing drag heretofore associated with transonic flight, and which constituted a major factor requiring great reserves of power to attain supersonic speeds." ^ a b Bob Allen (17 December 2015). "Dr. David E. Bowles, Director, NASA Langley Research Center". NASA Langley Research Center. Archived from the original on 1 January 2018. Retrieved 1 January 2018. NASA Langley, founded in 1917, is the Nation's first civilian aeronautical research facility and NASA's oldest field center. ^ "FY 2017 Agency Financial Report" (PDF). NASA. 15 November 2017. pp. 10, 24, 146. Archived from the original (PDF) on 1 January 2018. Retrieved 1 January 2018. ^ Bob Allen (28 August 2017). "NASA Langley Research Center Organizational Chart". NASA Langley Research Center. Archived from the original on 1 January 2018. Retrieved 1 January 2018. ^ a b Bob Allen (17 December 2015). "Dr. David E. Bowles, Director, NASA Langley Research Center". NASA Langley Research Center. Archived from the original on 1 January 2018. Retrieved 1 January 2018. Dr. David E. Bowles is the director of NASA's Langley Research Center, Hampton, Virginia. He joined the Director’s Office in March 2012 as Associate Director, progressed to Deputy Director in 2014 and then served as Acting Center Director for four months before being appointed Center Director in June 2015. ^ Joe Anselmo (February 17, 2017). "Aviation Week's Warning and the Founding of NASA Langley". Aviation Week & Space Technology. Retrieved March 7, 2017. ^ Tennant, Diane (September 5, 2011). "What's in a name? NASA Langley Research Center". The Virginian-Pilot. Retrieved September 5, 2011. ^ "Journey in Aeronautical Research: a Career at NASA-Langley Research Center, ch. 3". NASA. ^ "40 X 80 and 80 X 120 Foot Wind Tunnels". Rotorcraft.arc.nasa.gov. Archived from the original on 2016-03-04. Retrieved 2016-02-14. ^ "NASA Langley History and Description: Initial Activities". NASA LaRC Master Plan. ^ a b "NASA – Hypersonic X-43A Takes Flight". Nasa.gov. Retrieved 2016-02-14. ^ "NASA Cultural Resources (CRGIS) – NasaCRgis". Gis.larc.nasa.gov. 2015-08-04. Retrieved 2016-02-14. ^ "Tearing down NASA Langley's 16-foot transonic wind tunnel". Daily Press. 2011-07-08. Retrieved 2016-02-14. ^ "National Transonic Facility". Archived from the original on October 17, 2011. Retrieved November 14, 2011. ^ "Exploring NASA's Roots – The History of the Langley Research Center | NASA". Nasa.gov. 1992-12-31. Retrieved 2016-02-14. 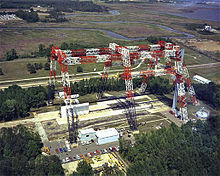 Wikimedia Commons has media related to Langley Research Center.